Sometimes, when I can't figure out what to write about, I go back and read my slice from the year before. That often gives me ideas for what I might write. Today, as I was thinking about closing out this month of slicing, I went back to last year, and I found this quote. And the quote still pretty much captures the essence of why I slice. I slice because I love stories. I love hearing other people's stories. I love movies and the theater. When I tell stories, I process and make sense of my life. When I hear stories, I understand other people better. And sometimes their stories give me insights into my own life, as a teacher, or as a parent, or as a human being. That's why I slice. For me, it's all about the stories. This year, I have told lots of stories. As I look back over my month, I see six slices about parenting. It troubles me more than a little that these stories seem to be similar to ones I have told the last couple of years, and I'm hoping that next year my sons will be in a different, stronger, healthier, more adult place. I see nine slices about teaching. That's less than most years, and I wonder why. There are a couple of slices about my current interest in dogs, several about my participation in Weightwatchers, several about other kinds of stories- the march last weekendHamilton, an author talk, and Paul, a movie I saw over spring break. And there are a few other random slices- lists or other formats that I tried on days when I couldn't figure out what to write about. I've enjoyed reading stories that I have followed for many years- Elsie, Ramona, Michelle, Stacey, Elisabeth, Cathy, Julie, Karen, and Karen, and lots of others (I hate writing these lists because I always forget someone important. I apologize in advance!). It's been fun to connect with some new Colorado slicers- Tamara (I've actually known her for many years, but this is her first year of slicing), and Morgan. As always, I've loved getting to know some new folks- Dani, Lauren, Andrea, Mrs. Tice (I wonder what's wrong with me that after a month of commenting I can't tell you her first name! ), Michelle, and Art Teachers Do It For the Monet, who pushed my thinking every day, through my work on the Welcome Wagon. And I've missed a few people that didn't slice this year- Linda Baie and Nancy Hatcher (I can't find her link right now). I didn't get as many comments this year as I have in other years. Maybe it's because I sometimes wrote later in the day; I really prefer to write in the morning because that's when I write the best, but March has been really busy, and my early mornings, when I like to write, have been filled with writing "jobs" for work. Perhaps, my slices were too long, and people would open them and think, "I'm not reading all of that." Or maybe my posts just weren't all that interesting. I wondered, though, whether people didn't understand the importance of comments as a way of building a writing community. I know it was not because I wasn't commenting- I usually responded to about twenty slices a day- all my old favorites, my Welcome Wagon folks, and then five to ten others. I know this isn't goodbye. For several years, I have written poetry the entire month of April. I didn't do that last year and I was really sad all month, so I'm going to try to resume the tradition this year. Currently, I'm thinking about jumping in with Amy Ludwig VanDerWater, a fabulous children's poet, who has just written a new book, POEMS ARE TEACHERS, that I want to see if I can buy today. And of course I will keep slicing on Tuesdays. Friday. My last day of spring break. I'd like to be cleaning, finishing my taxes, maybe going to a movie. Instead, I am helping Son #1 with health insurance issues. About two years ago, Zay started exhibiting some pretty disturbing symptoms. He was hospitalized two different times over the course of a year, and finally diagnosed with serious mental health condition. The good news is that it's treatable with an injection which he has to have once every three months. The bad news is that if he doesn't have the injection, he will wind up in the hospital again. And each time he relapses, it will be more serious, and the return to normal will be more tenuous. Last Friday, Zay was supposed to have his injection. He took time off work and went to take care of it. The nurse at the clinic told him he couldn't have the shot because his Medicaid had been cancelled. He needed to take care of that before they could give him the injection. I was leaving work when Zay called to tell me what had happened. His solution was to do nothing. "I'm feeling ok," he said. "I just won't take the shot." I freaked out a little. I knew that he was feeling ok because he was taking medication, and that if it wore off, he would be right back at square one, with another hospitalization. I hung up, and immediately called Megan, his case worker, who is pretty young and pretty inexperienced. She told me that Zay is an adult and that she would need to talk to him. I did get her to tell me that the shot would last two more weeks, so that we would be ok for a little longer. She and Zay had agreed that he would go to the Medicaid office on Monday and take care of it. I doubted that he would be able to do that on his own, but as she said, it was really none of my business. On Monday, Zay went into work late again. This time, he was trying to go to the Medicaid office. The one closest to our house told him he would have to wait over two hours. He didn't want to miss that much work, so he left. He called Megan, who gave him a phone number to try. All week I was on pins and needles. Zay needed his shot and we were running out of time. Finally, on Wednesday night, he gave me the phone number. "Every time I call," he says, "they put you on hold and you just wait and wait and wait. I can't do that at work, I'll get in trouble." I told him that I would try to call. On Thursday morning, I got through to Medicaid, after holding for almost an hour. Courtney, the woman I talked to, had to first get permission from Zay to talk to me. Luckily, he answered his phone right away. Courtney thought that Zay's Medicaid had been cancelled because he makes too much money. She said we would have to go to the Medicaid office, where they would either reinstate his insurance, or they would offer us other options. She said if we went at 8:00 one morning, the wait shouldn't be too long. Courtney also said it would take up to two weeks to reinstate any kind of insurance. After that, I called Megan, the caseworker again. Megan still couldn't talk to me. Zay talked to her, but then couldn't remember what she said, so that he could tell me. I had Zay do a three way call, so that we could all be a part of the conversation, without violating any of his rights. I explained the insurance situation and she said our only option would be to pay out of pocket. She told me it would be $1000. I swallowed hard and said I could take that out of my savings account. She also said that the Mental Health Center would not do anything for him unless we had some kind of proof that we were trying to straighten out the insurance. An hour later, she called back and said she had been mistaken, that the shot would be $2700-$3000. Because it was so expensive, she had asked if there was an alternative that they could use, just this time. The doctor said that there was, and that it would be free, but that it would only last one month. Megan told us to come in to get that shot tomorrow. She said we could also talk to the doctor, if we wanted to. This morning, Zay missed yet another half day of work. We were at the Medicaid office before they opened at 8. We sat there for almost two hours, watching people come and go, and Zay checking his watch every two minutes, before a woman finally came out and said Zay is no longer eligible for Medicaid because he makes too much money. He would have to apply for another kind of insurance, but he couldn't do that until Monday, because the system was down and she had to release his case. From the Medicaid office, we went to get Zay's shot, at an office on the other side of town. Last night he said, "I want you to go with me, because I want you to see what I go through every time." This time was no different. Zay went in to get his shot while I sat in the waiting room. Almost immediately, Zay called. He wanted me to come in and explain the situation to the nurse. She tried to tell me the shot couldn't happen today because the doctor wasn't there to write the order. I couldn't reach Megan to find out who she had talked to the day before. Finally after the nurse saw that I wouldn't back down, and after a little help from a friendly receptionist who hunted down a doctor, Zay had his shot. Two hours later, I can't stop thinking about this whole situation. What is wrong with our health care system, particularly for people with mental health issues, who probably can't take care of themselves? Why aren't the caseworkers who deal with my son more proactive? Why would the system prefer to have a patient hospitalized, maybe for as long as a month, rather than just give him a $1000 shot, insurance or not? Why isn't Medicaid easier to access and understand? What about people like Zay who don't have people like me? Who takes care of those people? My staff has a really nice blend of teachers in the first few years of their career, mid-career, and veterans like me, who are within a few years of retiring. Once or twice a month, we go out for "adult beverages" after work. The beginning-of-their-career teachers hang out together quite a bit, I think, and they always go. The mid-career teachers rarely go- they are busy raising their own families- picking up kids, making dinner, running carpools, etc. The veterans like me go about half the time. Truthfully, I'm never really sure those young teachers really want people their parents age around when they out after work. Usually, I only go if one of them specifically asks if I'm coming. Inevitably, the subject of dating comes up. Usually, it's after some people have already left, and there are only six or eight of us sitting around the table. The dating question travels clockwise around the table. Who's dating? Where did they meet him/her? How often? Long-term potential or not? I listen as the young teachers talk. L has recently met "the one" or at least he thinks she is. She's from another country, and this summer, he will be spending two weeks there, meeting her family. N typically dates for six or eight weeks, seriously at first, but then she gets bored. J is dating, via the internet, but she is moving to Thailand for a three year teaching assignment this summer, and isn't really looking for anything serious. And then they want to know about my dating life. I protest, "I'm old, you guys, too old. I don't date." That doesn't satisfy them. They think I should date. I try again, "I don't think I fill the requirements of those guys on the dating sites." This is like dangling raw meat in front of sharks. "So you do those dating sites, Carol?" "No," I say, "I don't pay for any of those dating sites. But sometimes I look at them. And those guys…"
N interrupts. "I know," she says, "they're all the same. There's the prerequisite guy on the beach in a tropical country, guy on a motorcycle, guy skiing, guy mountain biking, guy dressed up for a formal, guy with a dog or cat, and guy with a child." Everyone laughs. That really does pretty much sum it up. And it doesn't fit me. At all. I do kids and animals and beaches, but I do not do skiing or motorcycles or mountain biking. Ever. I could post pictures of me walking the dog, drinking coffee at Tattered Cover, or headed into a movie with a bucket of popcorn, or sitting on my back porch with a book. Those are the kinds of adventures I like. "I have a pretty boring life," I say. "I don't date. I'm too old for that." "But you're fun," L says. "You don't seem old." That feels a little like damning with faint praise, but thanks, I guess. "I know what we need to do," says J. "We need to write you a dating profile. I'm really good at them. And then we need to post it some place. There are lots of free websites. You could post it on Bumble. That one's free." "Or maybe on Our Turn," says R, the only other veteran still at the table. She met her husband about five years ago, when she out dancing, but has more recent experience with dating age. "That's people more our age." Instantly, they are all in. "Carol, it would be fun," they say. "Let's have a game night," says L. "We can play board games and eat pizza and write your profile." Again, they all think it's a great idea. They decide they will do it the Friday after break. And I'm wondering, "How in the heck did we get from having a drink after work on the Thursday before spring break to writing a dating profile for one of the oldest teachers on staff? And are they really going to go through with this?" And I wonder what they might write in a dating profile. I really think I am way too old for this. Even though I know it's much more economical to wait until they come out on Netflix. I don't care, I really love going to the theater. Today I had lunch with Claudia, a friend that I hadn't seen for a long time. It was a cloudy, rain/snow-any-second kind of day. We caught up on each other's lives, kids, work, etc. and then decided that since the weather wasn't very nice, we would walk across the street to the movies. Yesterday, Jennifer at I Hablo Español, blogged about how much she had enjoyed the movie PAUL, about the last days of the Apostle Paul, and his relationship with Luke, another one of the disciples. That one happened to be playing at the theater we went to, so that's the one we went to see. Jennifer was right, it was really, really powerful. At the point when the movie starts, Paul is an old man, imprisoned in Rome, for allegedly burning down half of the city. The Christians in the city are undergoing great persecution, and have basically gone into hiding. Luke, one of Paul's closest friends, sneaks into the city, so that he can visit Paul. He convinces Paul that are parts of his life story that have not been told, and scribes as Paul tells those stories. But my favorite thing about the movie was its overarching message of the power of love. Intentional, difficult, relentless love. Love in the face of evil and hatred. Love when you don't feel like loving. Love, even especially when it's hardest to love. I don't want to say a lot more (I already erased one paragraph because I thought it gave away too much of the movie), but I'd definitely recommend this movie. I want to see PAUL again, but I want to see it with a notebook, so I can write down some of the really powerful lines. And I want to go back to my Bible read the book of Acts, because I think I will read it differently having seen the movie. Definitely a perfect way to spend a snowy, rainy afternoon, during the week preceding Easter. I guess I should back up just a little. We moved into our current home eight years ago. The house came with a side-by-side refrigerator/freezer, with an ice and water dispenser built into the door. It is definitely the fanciest refrigerator I have ever owned. About a year ago, a little red light appeared directly above the water dispenser. "We need to change the water filter," said Son #2. I envisioned that we would somehow have to disassemble the entire door panel to do that. Those kinds of projects never go well at our house. "Mmm-hmm," I said, hoping he would forget about it. Of course he didn't, and about once a month, for the last year, he has reminded me that we need to change the water filter. And I kept telling him we would do it. Someday. When I was in the mood to dissemble the front panel of the refrigerator. Today he brought it up again. And after a (smallish) disagreement about the credibility of a parent who will not even change the water filter in the refrigerator so that her children don't drink excessive amounts of Sprite or get dehydrated and die somewhere in the desert of Denver, I agreed that I would buy a water filter and he could change it. "See," said my son, opening the opposite door of the refrigerator, "all you have to do is pop the old one out and pop the new one in." And so I went to Home Depot. I know that things like water filters are usually particular to the model of refrigerator, so before I left, I took a picture of the model number. The trouble was, by the time I arrived at Home Depot, approximately seven minutes away, that picture had disappeared. I texted my son again to ask him to send me a picture. He sent me a nice picture of the refrigerator. I was pretty sure that wouldn't be enough, so I texted him again, and he sent me a picture of the model number. I hate shopping. I especially hate shopping at hardware stores and fabric stores. I wandered around the appliance department and finally found someone to help me. At that time, he was standing on a ladder, but he said he would be glad to come down and help me. The water filters, it turned out, were right in front of me. I had walked by them two or three times. If they were snakes, they would have bitten me. I explained my water filter situation. "Do you remember what the water filter looked like?" my Home Depot friend asked. I confess that I have never actually looked closely at the water filter. "Or what number you got the last time you replaced it?" I confess that I have never actually replaced it, at which point he tells me you are supposed to change the water filter every six months. I estimate that we are sixteen water filters behind, but I don't tell him that. Especially since all of the water filters appear to cost $49.99, which is quite a bit more than the $10-15 I had envisioned spending. He asks again if I know the number on the water filter. I don't, but I try to show him the picture my son has sent me. He asks if he can enlarge it, but I don't know how to do that. He asks if he can see my phone, and I gladly turn it over. He tells me that there are actually two pictures of the refrigerator, but that the first one, the one I took, is a movie, so you can't actually see any numbers. He asks if he could delete that one. My friend enlarges the remaining picture, but then it seems that the model number of the refrigerator is not enough. We need the number on the water filter. I call my son again. Son #2 is not the most patient person, and I can tell he is a getting a little exasperated, but he goes back to the kitchen and reads the number over the phone. I repeat it to my new best friend at Home Depot, and he looks it up on his phone. "Yep," he says, "you need a number four. That's this one." He pulls it off the shelf and hands it to me. 'If it doesn't fit," I say, "Can I bring it back?" "Of course," he replies, "Just save the receipt." As I check out of Home Depot, visions of returning to school next Monday are already dancing through my head. One of my colleagues is in Florida, overlooking a beach. Another colleague went with his girlfriend (maybe his fiancee by now) to California. Still another went to Mexico. And me? I spent an entire day, or what felt like an entire day anyway, buying a water filter at Home Depot. It doesn't get much more glamorous than that! The hardest part of being the parent of a young adult is that my tongue is sore all of the time. That's because I am constantly biting it. Son #1 has an ongoing medical condition. He has to have a shot once every three months. If he doesn't have the shot, he ends up being hospitalized for an extended period of time. On Friday, he went to get his shot. And they refused to give it to him. They said his Medicaid had lapsed. He didn't know that it had lapsed. I didn't see any mail from Medicaid, so I didn't know either. The situation has caused me to be pretty stressed this weekend. He doesn't like taking shots, and doesn't understand that the fact he doesn't have symptoms while he is medicated, is related directly to the medication. The fact is, that he has to have the shot and he has to have it really soon, otherwise, symptoms will start appearing. Last night, I asked him about it. "Do you need any help with the insurance stuff?" "Nah, I got it. Well, maybe," he responded. "What time does that place open?" I look it up on the internet. "It's open from 8-5. Are you going to go tomorrow?" "Nah, I gotta talk to my boss, and see when I can go in late." Immediately, I go into worry mode, remembering that he just went in late on Friday, because that is the day he was supposed to have the shot. Maybe his boss will be unhappy that he is asking for time off again. "Can you call Medicaid and straighten it out?" I ask. "Nah, they will just leave me on the phone forever. My boss doesn't like us being on the phone," he says. I swallow hard, and try to shake free of all of the worrying What if he loses his job? What if he can't straighten out his Medicaid? What if he doesn't get the shot? What if he ends up in the hospital again? I bite down hard on my tongue. "OK, let me know if there is anything that I can do to help," I say, trying to keep my voice light and even. Today it happened again. Son #2 is applying for a job delivering sandwiches. He has an interview at 3:00 today. I probably would not have even known, except he needed quarters for parking. Which I didn't have, and had to make a run to the store to get. I have a million questions about this job. First and most importantly, I wonder why he, as a 22-year-old man, is looking for a job delivering sandwiches. It feels like he should be looking for something more permanent. But at least he would be working, which is better than what he is doing now. My other questions have to do with this particular job. It's downtown. I know he wouldn't be excited about riding the bus, and I wonder whether he would have to pay for parking every day. Parking is at least $15 a day downtown, and I wonder whether the amount he would be making would justify taking the job. I wonder how much he would make. And again, I bite my tongue, because he's a young adult and can make his own decisions. My tongue is sore all of the time. I guess that's part of parenting a young adult, but it's really, really hard. So I'm going to be honest. It was the first Saturday of spring break. I went to Weight Watchers. I went to dog training. I got home around noon. I had lots of reasons not to go. As soon as I walked in the front door, my sons started asking when I was going to the grocery store. And I have promised myself I am not going to diddle away this break. I am going to finish my taxes and get them sent off. I am going to do some serious house cleaning. I would have to go alone. I hadn't made a sign. And yet, I knew I needed to be there. It's expensive to park downtown, so I looked up the bus schedule. The bus would be at a corner two blocks away in 20 minutes. I put on my tennis shoes and headed out the door. When I got to the bus stop, I discovered that route was temporarily discontinued, because there is a paving project. I needed to walk eight more blocks to catch another bus. And yet I knew I needed to be there. I walked to the next stop. Waited twenty minutes for the bus. I got to Civic Center Park just before the March started. Organizers estimated that there were 100,000 people. We listened to speech after speech after speech. A father who lost his son at Columbine. A woman whose father, a teacher, was killed at Columbine. Her ten-year-old son, the grandson of the teacher killed at Columbine. A young man who had been in the theater during the Aurora Theater shooting. A mother whose only son was supposed to be at the Aurora Theater but changed his plans at the last minute when his friend had to work late. Three college kids who lost a friend during the Arapahoe High School shooting. A ten-year-old girl who began having panic attacks after a false lockdown alarm at her school. And Maddie, a student who was at Stoneman Douglas, hiding in the corner of a classroom during the shooting. And then we marched through downtown Denver. White people. Black people. Brown people. Old people and teens and babies in strollers. All together because we are America. And things need to change. I am glad I went. I'm trying to find a hobby. Since I've always loved dogs, it makes sense that this new hobby might involve dogs. And so I've been going to training classes at Canine Partners of the Rockies two Saturdays a month. I love helping with the dogs. And I often learn something about teaching kids as well. The handlers and dogs were working on the "Wait" command. You might know that command as "stay." But the dogs at CaPR "wait." Angela, the trainer, was modeling the task with Nugget, who is an advanced dog, almost ready to become a full-fledged service dog. She could put Nugget in a "wait" and then turn her back and walk away for several minutes. During that time she might pet another dog, talk to a handler, or even shake the treat jar. Nugget would still be waiting when she came back. When it was the other dogs' turn, she cautioned the handlers to set their dogs up for success. With Willow, who is only 14 weeks old, the handler never moved more than one or two steps away. And the "wait" was probably never more than 30 seconds. Valor, an exuberant eight-month-old, could wait while his mama backed up about ten feet, but that was definitely far enough, and he really struggled to concentrate if he was too close to the other dogs. Ully's trainer thought she would be ok if she left her and walked across the room, but Angela cautioned her to try an easier move first, and if Ully was successful there, then she could try something harder. Ully was ultimately able to handle the more difficult task, but she had had success at the easier one first. Angela reminded the handlers that sometimes their dogs would be able to do tasks at home, where there were not many distractions, but that those same tasks would be much more difficult in other situations, e.g. in the class today, when there were eight dogs, and about 15 people. Angela told the handlers that they should always, always, always set the dogs up to be successful. When the dogs were successful at an easy task, then the handler could up the ante just a little. The dogs learned by success after success after success. And when they failed, the handler simply reset the dog, and tried again, with a task that was a little easier. There was never any punishment or mean voice or anything like that. Not even a "No!" Just a reset and try again. As I was watching the dogs, I was thinking about the kids at school. We're all about rigor these days. The texts always have to be complex. The writing tasks daunting. And everyone gets the same task to do. And right now, a week before our state tests, the tasks are really hard, and there are a lot of kids that are not experiencing a lot of success. And I'm seeing a lot of discouraged and/or frustrated kids. People don't learn a lot from repeated failures. Tonight I'm thinking about my friend Lori Conrad, who always says, "Learning is success remembered." And I'm wondering what we as teachers might learn from the dogs and their handlers. I am not an organizational goddess. In fact, my organization typically sounds like, "Hmm, spring break starts today. I really should take my car in for a tune up next week." And then I call my mechanic. And he tells me he's full for the next two weeks, but that I could come two weeks from Thursday. And so then I have to drop off my car, and take the bus across town to work, work, take the bus back to the garage, and pick up my car. But not this time. Nope. This time I really was an organizational goddess. About a month ago, on Presidents' Day, to be exact, I had a flat tire. So while I was at the garage getting the tire fixed, I made an appointment to get the car tuned up on Monday, the first official day of spring break. I was so proud of myself! Today, I called to ask a question. The handle had come off of the car door on Sunday. I wanted to know if the garage could fix that as well, when I took the car in on Monday. "Monday?" said Christy, the office manager at my garage. "I don't see your name on Monday. Who did you talk to?" "I talked to you, " I said, "Do you remember when I had the flat tire on Presidents' Day? I made the appointment then. " "You did make an appointment," she said, with kind of a surprised voice, "but you aren't on the books now. We had some computer issues a couple of weeks ago, and it erased some appointments. Yours must have been one of them. We are pretty booked up on Monday. Can you come on Thursday or Friday instead?" I thought about how carefully I had arranged my schedule for the week. Saturday taxes, Sunday Colorado Springs to see my mom, Monday, car in the garage so I would do some cleaning, Wednesday, lunch with a friend, Thursday take the dog to the vet. I really was trying be organized and proactive. So much for being an organizational goddess. I think it's highly overrated. Six o'clock tonight. Star and I are out for our evening walk. I have had a super busy week and between weather and that, we haven't walked much. She is pulling extra hard tonight (no one ever asks me for the name of my dog trainer), so when I see a couple coming toward me, I pull her off the sidewalk, so we won't run them over. We pass each other and then I look again. I know this man. It's Coach Mark, from the boys' high school football years. Immediately, I am taken back about ten years. Summer 2008. Son #1 is just starting high school. Football workouts start in June. Zay doesn't drive yet, and we live about 15 miles from the high school, so I spend many hours sitting in the car, or in the grassy area outside the football field. Today, I am sitting in the car reading. I hear a tap on the window and look up. It is Coach Mark. - They need someone to ______________(wash uniforms, head up the fundraiser, organize a team meal).- My son has committed some infraction. I wonder which it will be, but Coach Mark does not want either of those things. He wants to know if he can take my son to lunch. "To lunch?" I say, "Is everything ok?" Coach assures me that it is. He just wants to get to know my son. I offer to pay for the lunch, and he tells me that isn't necessary. I think I shove a $20 into his hand anyway. Over the next four years, Mark is Zay's coach, but he is far more than that. He is a math teacher by trade, and spends many hours tutoring my math-challenged son. He handpicks teachers to fit Zay's needs as a learner. He checks on his grades every week, and makes sure he is caught up and eligible. When Zay has trouble- with a teacher, or with a girlfriend, or with another student, he heads for Mark's office. Tonight, Mark and I chat for ten or fifteen minutes. We talk about the boys and about Mark's current job, then we go our separate ways. And I am so thankful, once again, for the angels that have been placed in my boys' lives, exactly when they needed them. "I remember when she was in kindergarten," I say, as the third grader rushes past me, carrying a guitar that is almost as big as she is. "It goes so fast." "For them it does," he says. "But for those of us waiting to retire, it goes really slow." I look at him, "Are you waiting to retire?" I say. "Yep," he says. "I'm done." I look again. He does not look that old. "How much longer are you going to work?" I ask. "Nine more years," he says. "I have nine more years. I have to wait until I am 55." "Then what will you do?" I ask. "Work as a technician," he says. "I like working with computers." And then I do not know what to say. I am 13 years older than he is. Could retire pretty soon, if I wanted to. I love my job. I love working with kids. I can't imagine what I would do if I had to retire. I would probably come back and work as a full-time volunteer. Teaching is not what I do. Teaching is who I am. Three of us are walking out of Spanish class. I have had a 14 hour day. I still have several more hours of work when I get home. My head aches, as it always does after Spanish class. I have done way too much thinking. Her car is dead. She needs someone to jump her. She has her own jumper cables. D, one of my classmates says that she is driving a Hybrid car and doesn't think she can jump people. C, the other woman walking out with us doesn't have her car. She is riding home with D.
I know I should offer to help, but I am so tired. Before I can say anything, D jumps in. "Our Spanish class is right in there," she says. "I'll bet someone in there can help you." I wonder who might be able to help. I picture L. She usually leaves her two small children at her sister's a few blocks away, then dashes away afterwards to pick them up. I think of Bex, our instructor, who has bronchitis and has coughed her way through class. I slide by quietly without saying anything. I know I should offer to help. Instead, selfishly, I get into my car and drive away. Wondering why I don't offer to help. Wondering why I am not a little nicer. Forty-five minutes until slices for today close and I have not sliced. But I have a good excuse. Or at least a kind of good excuse. I have been trying to slice in the morning, but this morning I had a lot of school work left to finish. And tonight I went with my book club to see Helen Thorpe. Helen Thorpe is an award-winning Colorado author who writes narrative nonfiction. Her first book, JUST LIKE US, details the life of four high school girls, several of whom are undocumented immigrants, trying to graduate from high school and navigate the world of the university. Her second book, SOLDIER GIRLS, is about veterans. 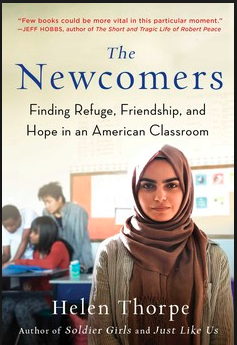 Her newest book, THE NEWCOMERS, just released in November, is about a classroom at Denver's South High. The classroom is what's known as a "newcomers" class, for students who have just arrived in the United States. Helen Thorpe spent a year in this classroom, following teacher Eddie Williams, and his 22 students from places as far away as the Congo, Burma, Iraq, and Mexico. Tonight, the South High PTA sponsored an author talk about the book. First four women, all immigrants- one a paraprofessional from Sudan, Mariam from Iraq, then another young woman who just won second in state wrestling, and finally, a 9th grader, who stopped several times during her talk to wipe away tears. Finally, Thorpe got up and showed slides and talked for almost an hour. And it was one of those talks that left me feeling like I need to do more. More to better the lives of people who need the riches the wealthiest country is more than capable of providing, if we choose to do so. More to better the lives of the refuge students at my school. More to help all of my students understand that their voices really do matter, and it's important to learn to write well, so that you can tell your stories and bring about change in the world. My slice is really late tonight. But I have a really good reason. Tonight I was inspired by a writer who really knows how to use her voice to make change in the world. I want to be a writer like that. I got up early this morning and read writing that our kids had done on an assessment that our district uses three times a year. We did it last week, two weeks before our state's "blessed event." Some of the writing looked really good. But a lot of it did not look that good at all. So now I'm thinking, "OK, I have to give people feedback. I have to give feedback to kids and I have to give feedback to teachers." And I know it's a matter of staying calm. Of breathing deep. Of finding that one good thing that the writer/writing teacher did and building on that one thing. Of looking forward to the next teaching point, the next desired success. Over and over and over again. But how do I do that for A, a student's who entire essay consists of three quotes that he lifted from the text. The quotes might work, if he can explain that. But how I explain that in a way that makes sense to him? And how do I address half of the third grade class, who wrote short constructed responses instead of the five paragraph essay they were supposed to write? And whose typing is simply not that good yet? And who still are not using their and there correctly? And how do I address those almost successes- those kids who aren't there yet, but whose approximations are pretty strong, and are just in need of a little tweaking, and they might even be proficient, if they get a decent prompt? Or those kids that write really, really well and just need to buckle down and bring it on the day(s) of the test. I need to be calm, and encouraging, and affirm the success/progress we have made so far. I need to think about what one thing we could put into place that would make the biggest difference. And how do I talk to their teachers? Adults who have poured their hearts and souls into teaching kids to write. Adults who know that it takes a lot of slow to grow. Adults who need to teach their hearts out for the next two weeks, but then let it go, knowing that they have done the absolute best that they can. How do I communicate the urgency of the situation and yet not send a message that is critical or stressed or unkind or accusatory? How can I help us stay together and push forward and do our best for the next two weeks? And then I am thinking about my own sons, limping their way into manhood. How do I affirm the positive aspects of their character? How do I communicate that I love them, but that I will not allow them to live in our home and do nothing? How do I help them understand that some things may be legal, but are not necessarily profitable. Spring is probably my favorite season. And daffodils are one of my favorite parts of that season. We don't have any daffodils in Colorado yet, but the crocuses are up, so I suspect within the next week or so, they daffodils will begin appearing. 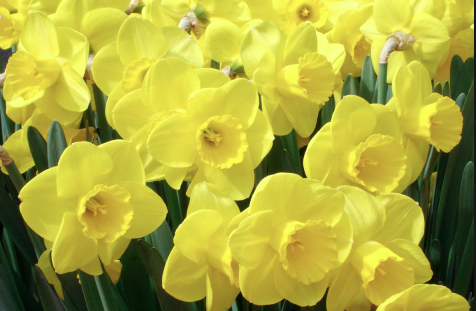 Every spring, I share one of my favorite poems, "Daffodils," by Ralph Fletcher. Ralph's poem first appeared in his book, ORDINARY THINGS: POEMS FROM A WALK IN EARLY SPRING. I was really surprised to discover that this book was published in 1997, I would have said it was about ten years old. I guess then, that it's an oldie but a goodie, but it's definitely worth adding to any poetry collection for kids if you can find it. This year, I decided to put my own twist on Ralph's poem. I have been watching people write "Golden Shovel" poems, where you lift a line from another poem, and then use the words from that line to form the last word of each line of a new poem. I decided to try it with daffodils. Not sure I was all that successful, but at least I can say I tried. preview of upcoming redpinkpurple summer show. Fellow Coloradoan, Linda Baie, is hosting Poetry Friday today. You can read more slices at Two Writing Teachers. Slice #15- Another Missing Chapter in the Parenting Book. I definitely need to buy a new parenting book. The one I have is missing waaaay too many chapters. Take the one I need right now, for instance. The one about how to help your adult, or kind of adult children figure out what they want to do with their lives. Or how to help them rescue themselves when they get stuck in a whirlpool that is going nowhere. Son #2 came back from college about three years ago. He had tried two different junior colleges and just didn't like it. Not very long after that, he started working a series of jobs-- usually food related. He's made doughnuts, delivered calzones, and worked the counter and in the kitchen at a sandwich shop. The pattern is pretty much always the same. He works for six or eight weeks, gets bored, and quits. He hangs out for another month or so, then when I threaten that he either has to find a new job or a new place to live, he finds another dead end job. This time has been one of the worst. He hasn't worked since before Christmas. Supposedly, he was going to take three months to get himself into shape, and then join the Air Force. He has already taken a test that says he is qualified for some really high level group that sounds kind of like the Green Berets. But somehow, he hasn't done that. And then in January, he decided he was going to go back to school. I helped him fill out the application online and gave him money to park at orientation. He came home saying he wasn't going to go to school. I am still not sure what happened with that one. Since then, he's pretty much done nothing. Well, actually not nothing in his book, but nothing in mine. As far as I can tell, he plays endless video games, finds complicated recipes and texts me lists of ingredients, bakes ginormous (and very delicious) million calorie chocolate chip cookies, and watches lots of You Tube and Netflix. About two weeks ago, I had had it. I told him he had to have a job by March 24th, period. And so he borrowed money from his brother, got a haircut, and today he went and had an interview. He said it went well. It would be full time. He would work from 10-5 making smoothies for $10.50 an hour. He will find out if he got it this weekend. He probably did. He's smart and articulate and usually makes a good first impression. And I'm not sure how I feel. For starters, it feels a lot like the past five or ten jobs he's had. And I wonder how long he will last (even though I have told him that he cannot quit another job and live in my house). And wonder if I should tell him, before he even starts, that in about a week he is going to get really tired of driving across town to work at a smoothie shop. And I wonder how to help him understand that the CEO of most companies started out washing dishes or cleaning toilets. And that the world doesn't owe him anything. And that it doesn't matter if he is smarter than the boss, or if he thinks the company should be better run-- he is not the boss and he needs to keep his opinions to himself and do what people tell him to do. And I wonder how I can help him develop a little stick-to-it-ive-ness. And how I can get this 22-year-old no longer a child to start think about a career, rather than simply a series of dumb little high school-ish jobs. And how I can maybe, if he wants to, help him get back into school because he is plenty smart and really needs to do something with the brain he was given. Basically, I'm pretty much at an impasse in the parenting department. And I could really use that missing chapter. I am sitting on the floor in the middle school hall, when the passing period bell rings. It's the last question that probably needs answering. This all started about twenty minutes earlier. I had just finished recess duty and ran through the office to drop off the walkie talkie. The kindergarten teacher stopped me. "Can you help me with X? He's having a hard time, and no administrators are available. I left him by the music room while I came down to get help." I know X well. About a month ago, I helped him sort conversation hearts. "You can color the graph, Dr. Carol, I'll eat the hearts." Last week, when I was administrator in charge, he threw a pencil at his teacher. As we are heading toward the music room, his teacher fills me in on the situation. It seems that the class was going to specials. For some reason, X got mad at another little boy. He made the L sign (for loser). The teacher says that J's parents were already complaining about X and she thinks they are going to be very angry. Something has to be done. We find X sitting in a chair outside the music room. He tells me he wants to go to music. I tell him he can go to music, but that we have to solve this problem first. X gets up and stands next to the drinking fountain, which is mounted in a recess in the wall. He takes a drink, a very long drink. I wait. Hydration is always good. The computer teacher walks by. "You need help?" X squishes himself into the corner behind the drinking fountain. I wait some more. After a pause of two or three minutes, X says again, "I want to go to music." He dashes across the hall to the music room, but the door is locked, so he can't get in. Again he says, "I want to go to music." I remind him that he can go to music, but that he did a mean thing, and hurt his friend's feelings, and he has to solve that before he can go to music. I ask if he is ready to try to solve it. Two or three minutes later, X says again, "I want to go to music." I ask if he is ready to solve his problem. No words, but he nods his head yes. I try to get X to talk about the situation. He tells me that J cut in front of him in line, and he was mad, so he did the L sign. "What does that mean, anyway?" "That means loser," I say. "It's a very mean thing to do to people. If you do mean things, people won't want to be your friend." "I just want to go to music." Just then, the music room door opens, and children begin coming out into the hall. They are going to the auditorium to practice their piece for the music program. I see J and pull him out of the line. X is now squished in the space behind the door. "He did the finger to me," J says immediately. I imagine him telling this story to his parents on the playground after school. At the same time, the situation strikes me as a little funny, and I fight back the urge to laugh. I explain that X did something mean, but it was not "the finger." Now he is very sorry. He wants to apologize. I coax X out from behind the door. "Do you want to say something to your friend?" I say. X says in a voice that sounds only a teeny bit sorry, "Sorry." By this point, I am pretty sure we are going nowhere fast. I decide I will have to have the kindergarten teacher explain the situation to whoever picks J up. "Do you promise you won't do that sign again?" "Yes," X says more than a little grudgingly. I ask X if he accepts the apology. "I guess so," he says, also more than a little grudgingly. I explain the situation to the music teacher and put the boys back in line to go to music, then head down the hall to tell the kindergarten teacher she has to tell J's parents that X did the L sign, not the finger. Just another day in the life of a literacy coach. It seems like people are doing a lot of lists as slices this year. Every time I read one, I think, "I should try that some day." Most people do them in relation to the calendar number and suddenly, it occurred to me that if I didn't do one soon, I'd be having to write a 28 item list! I decided to try this one after I read fellow Coloradan Tamara Jaimes' Eleven Things About Me as a Reader. (Tamara is a terrific writer, by the way, and if you haven't read her blog, you should definitely check it out). 1. I was one of those kids who went to school knowing how to read. Actually, I have been a reader since I was a very little girl. The first book I remember reading was HOP ON POP. I vividly remember the last page- there is a yellow circle with red words. The words are all pushed together and I remember finding the individual words within that huge block of red letters. I haven't stopped since. I will not, however, tell the story about getting kicked out of second grade reading group because I told the teacher I was not interested in learning about short e.
2. I come from a long line of readers. My grandmother was the head librarian at a branch in the Chicago Public Libraries. My mom went to bed with a book every single night. Four years ago, she had brain surgery and has some trouble with her eyes, but she still reads two or three books a week. My father read slowly, and said he wasn't a reader, but he always had a book going. When I was in college and a young adult, he and I read John Grisham together. 3. As a kid, I loved series books- The Borrowers; Betsy, Tacy, Tib; Miss Piggle Wiggle, Nancy Drew. My all-time favorite was the Little House series. My grandmother gave me the series, one at a time, for every Christmas and birthday for about three years. I still have my Little House books. Somewhere, I saw someone sign the front of a book, so I wrote a note to myself in one of the first ones My grandmother saw it, and she started signing them for me after that. 4. As a reader, I loved, loved, loved riding my bike to the bookmobile. I still remember the sweet, slightly flowery smell of Mrs. Holly's perfume. After the library, we would always go to the drugstore for penny candy. That was my sisters' favorite part, but I couldn't wait to get home and start reading my newest treasures. 5. My sons are not readers. I adopted them when they were seven and nine. I read to them every single night, and we had family reading time where everyone had a book or magazine, until they were in high school. I still leave things laying around for them to read. Despite all of this, they do not like to read, almost never pick up a book or magazine, and it breaks my heart. 6. I have been in the same adult book club for about 25 years. There are six of us. We used to meet consistently every single month. Now it's more like every six or eight weeks, which makes me a little sad, because those are some of my best friends, and I enjoy being with them. Right now we are reading The Newcomers by Helen Thorpe. We are going to see Helen Thorpe next Monday. 7. I don't like fantasy. At all. Not dystopian literature. Not science fiction. Not even talking animals. OK, an occasional talking animal, but not many. I have never made it through the Harry Potter books, although I did see most of the movies. 8. Right now, I read mostly YA. That's because I am teaching a seventh grade reading class and I feel like I always need to be ready to recommend a book to a kid. Yesterday I finished Sunny, the newest book in the Jason Reynolds' Track series. I liked it, but I think Ghost is still my favorite. I'm currently reading Takedown by Laura Shovan, about a girl that wants to be on a boys' wrestling team. 9. Even though I loved series books as a kid, I don't read very many now. I do, however, go on an occasional author binge, usually with children's books or YA. In the last year, I have read almost all of Jason Reynolds books. I buy anything Barbara O'Connor writes (How to Steal a Dog is my favorite). Recently, I've been reading a lot of Elizabeth Wein (Code Name Verity and Rose Under Fire). Next up is Ruta Sepetys. I heard her talk at a luncheon and she was fabulous! 10. I love narrative nonfiction. Last year, my book club read Boys in the Boat, about a rowing team from the University of Washington. I loved it. Everyone else thought it was really long! I also love historical fiction. World War II seems to be the period I gravitate toward most. My favorite book in the last two years is All the Light We Cannot See by Anthony Doerr. 11. I've recently become a fan of audiobooks. I almost always keep one in the car. Audiobooks keep me sane in Denver traffic. They also are a good companion when I'm driving back and forth to Colorado Springs every weekend. I haven't had time to go to the library the last couple of weekends, so I don't have one right now. I really needed one last weekend, when I drove back and forth to Colorado Springs twice. 13. I also love the public library. I had the same card for 25 years. Every time I would get it out, the librarians would ask me if I wanted to replace it. Even so, I hung onto it until it finally cracked in half from old age. The Denver Public Library is amazing, and I go pretty much every other Saturday. I also go there to grade papers-- it's just noisy enough to focus. We had been waiting almost two years. And finally, Saturday was the day. My mom and I used to go to the theater pretty regularly. Before I had my sons, we even to New York City a couple of times. We would go on Broadway binges- fly in on Friday, see a show Friday night, two shows on Saturday, two on Sunday, and then fly home on Monday. Big fun! Two years ago, when we heard Hamilton was coming, I asked my mom if she wanted to go. And of course she did. The problem was, you couldn't just get tickets to Hamilton. You had to buy season tickets. So for two years, once every couple of months, we've been to a play. This year, we've been to WAITRESS, FIRST DATE, THE KING AND I. We usually make a day of it- I drive down to Colorado Springs to pick her up, we have lunch in a little cafe by the theater, we see the show, and then we head back to Colorado Springs. But for HAMILTON, we made a weekend of it. I picked her up about 1:00. We came back to Denver and checked into a hotel directly across the street from the theater. We had dinner at our favorite cafe. And then we saw the show. I probably shouldn't confess that I just went online to see if I could get a single ticket to see it again over spring break. I could, if I want to spend $250. Definitely a day I will never forget. The day I saw HAMILTON. Sometimes I forget why I teach kids to write. At this time of year, with our state tests three weeks away, that is especially true. It feels like everything is about making sure kids can pull together a coherent five paragraph essay, complete with claim, three body paragraphs, a counter claim (for the older kids, and a conclusion. On Friday, I was reminded twice about why I care about helping kids become good writers. First I was in a fifth grade classroom. The kids were writing persuasive letters to our principal, Mr. M. The teacher had modeled with a topic she and I brainstormed the day before, then it was the students' turn. Each student chose a topic. I wandered the room, conferring with kids. Students had written about lots of different things. D earnestly told me about how Mr. M needed to buy locked cabinets for the art room, and then new supplies to stock the cupboards, because too many kids were stealing paints, and he couldn't do the projects he wanted to do because he needed colors that weren't there any more. M wants the school to add an Advanced Technology Class because he wants to learn to code. J wants us to reseed our soccer field because there are too many stickers. Not only do the balls get punctured, but the kids get stickers in their hands. I was struck, as I read their writing, by the earnestness in their voices, and by the quality of the writing. These clearly were letters that mattered to the fifth graders. Later that afternoon, I watched a teacher candidate do a lesson on persuasive writing. He first showed "Take a Knee," a video from Kwame Alexander's website, then asked kids to react, first in writing, and then by talking. The kids were clearly interested in the topic and responded with a much higher level of engagement than usually seen 30 minutes before dismissal on Friday afternoon. The passion of X, however, was particularly impressive. X said something to the effect of, "We learn about Rosa Parks, who sat down on the bus for us, and we learn about Martin Luther King, but if we don't do our part, what difference does it make?" She went on for two or three minutes, much more eloquently than I am doing here. When she was done, her classmates responded with spontaneous applause. I can't stop thinking about those two situations this weekend. Kids need to be able to write persuasively. They need to understand the structure and mechanics of this kind of writing. We are doing that for our students. What we are not doing, I think, is allowing kids to develop and exercise their voices. We are not allowing kids to write about topics they care about. We are not helping kids develop their own strong voices and their own opinions. We are not helping kids to develop into people who use their voices to be strong and responsible world citizens. And that makes me really, really sad. Because isn't that what persuasive writing is for? I'm not a spring chicken. I'm 59 years old. And in the next few years, I will need to start think about retiring. A lot of people are excited about retiring. I love, love, love my job. Love working with teachers. Love kids. Love sharing books with teachers and kids. I work a lot. Probably upwards of sixty hours, and some weeks, like this one, closer to 80. If I retired, I would need something to do. I don't have a husband. Never have. Probably never will. Most of my friends are married. They do things with me, sometimes, but most of their lives are about their spouses. I get that and it makes perfect sense, but it also makes for a lot of lonely weekends. A couple of years ago, I started thinking about a hobby. My hobbies right now are reading, kids, and learning about my craft, by going to education classes. I don't knit or sew or paint. I don't cook or bake. I kill pretty much every plant that comes into my house. I don't know how to play bridge. I'm not saying that I will never do those things, but I definitely don't do them now. I thought about things that I love. Not including kids and teaching and books. One thing that immediately came to mind is dogs. I love dogs. And so I started thinking about hobbies that involved dogs. For the past five or six years, I've watched a web cam, Warrior Canine Connection, that raises dogs for veterans with PTSD. They are located in Maryland (they might be opening a branch in Colorado soon), so that's a little too far away. Last summer, though, I ran into Debbie, a friend I had taught with years ago. Debbie was accompanied by Shadow, an enormous black lab that she is raising for the Canine Assistance Partners of the Rockies. Shadow is in advanced training and within the next six months he will become a mobility dog for a woman with multiple sclerosis. I told Debbie I was looking for a hobby, and was interested in dogs, and she invited me to attend training with her. And so since last fall, I have been attending classes two Saturdays a month. Besides Shadow, there are anywhere between 5 and 8 dogs, all labs, ranging in age from 4 months to a little over two years. I don't get to do a lot- sometimes I hold a dog's leash at one end of the room, while the owner walks to the other end of the room and calls them, or I serve as a prop in a training exercise. Everyone once in a while, if the trainers have brought an extra dog, I get to hold a leash and take the dog through the exercise. I have loved these Saturday mornings. I love the dogs and their handlers. Besides Shadow, there's Ully, an 18-month-old black lab. Her puppy parents, J and M, are a retired occupational therapist and sociology professor. Ully is their third service dog. Their second dog, Rosie, is the mama to Willow and Walker, two bouncing four-month-old pups who just came from Maryland, where Rosie whelped after she was bred to a dad from the Warrior Canine Connection. And there's Valor, an high-spirited seven-month-old black lab, who is just learning to curb his impulsive tendencies so he can become a service dog. His mama is about my age, recently retired. She took Valor in respite care, and then became his full-time mama. She makes me laugh every week with his exploits, most of which involve his fascination with toilet paper. I'm not sure yet what my role with this organization will be. They'd like me to raise a puppy and take it to school like Debbie did with Shadow, but I'm not sure I'm ready for that yet. Puppies, and especially service dog puppies, are a LOT of work. I'm also not sure that my aging lab, Star, would appreciate or be kind to a puppy. I might become a respite care home, for the dogs when their owners go out of town, or just have a situation when they need a break. Or I might just volunteer in the office this summer, at least for the time being. At any rate, I need to find a hobby. I'm hoping that raising service dogs might be a possibility. I'm discovering it's all about the grout. that somehow hold the whole thing together. Boy and boy and boy. Racing down the hall, someone, usually with a girl in hot pursuit. Downs lunch so he can head out to the basketball court. That body needs to move. End of class clean up. but he's also easily diverted to an arm wrestling match or quick boxing tournament. D was like most of his classmates. and he didn't want to miss anything. And yesterday he started Alan Gratz's REFUGE. He's downing about one book a week. Shoving them into his backpack to take home every night. Bringing them back a little the worse for wear. because D is becoming a reader. I think it's partly because of deliberate decisions on my part. 42 IS NOT JUST A NUMBER. Not really short, but not too long either. A few black and white photographs. When I was done, I passed it off to D.
That pretty much got him going. And since then, it's just a matter of watching where he's at in his book. Always being ready to offer a new title. And I'm thinking D might like Jason Reynold's track series. It's about a girl who wants to wrestle on a competitive team. I'm only a little way in. But I think it's one D will love. and take off on an Alan Gratz marathon. and can help D keep that constantly moving body, and those zinging hormones in check). that's it's really about the grout. It's those moments that are the grout. is really about the grout.